You got the medical school interview you wanted. Now what? Be prepared. Be confident. Make the best impression on your interview with our coaching and guidance. 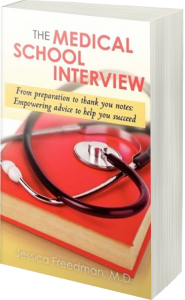 The interview is the most important factor in the medical school admissions process. Whether you are preparing for an MMI or traditional medical school interview, MedEdits’ experienced faculty will help you do your best on interview day. MedEdits Faculty at the Professor level are the most experienced private medical educators and advisors in the industry with a minimum of ten years of medical admissions and advising experience at some of the most prestigious medical institutions in the United States. MedEdits faculty at the Assistant Professor level have at least two years of medical admissions/advising experience at some of the most selective medical schools and residencies in the United States. Because our Assistant Professors are currently affiliated with academic institutions, we do not list their names or biographies. MedEdits’ questionnaire sent to student upon registration. Each one hour mock interview includes: 1) Prereview of background materials. 2) Verbal feedback during session. 3) Written feedback after session. Collborative Workspace: MedEdits' student portal which helps you stay organized, set appointments, and get your questions answered by your advisor and team. Detailed MedEdits’ questionnaire packet will be sent to student upon registration. Each one hour mock interview includes. MedEdits faculty will review the questionnaire and application materials prior to session. Verbal feedback of interview questions during session. Written feedback of session after session with be sent to the student. Collborative Workspace: MedEdits' student portal which helps you stay organized, set appointments, and get your questions answered by your personalized advisor and team. Practice with our former medical school admissions officers, the most experienced and established medical educators in the industry. 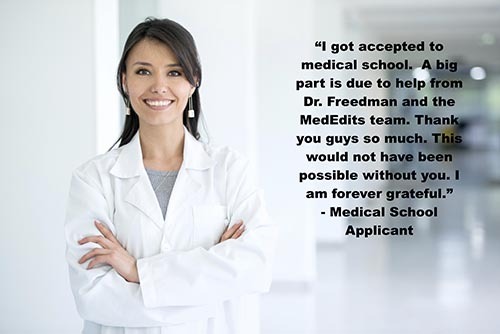 We have helped hundreds of applicants get accepted to medical school! 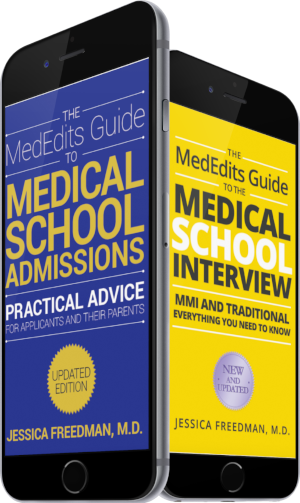 Related: Stay up to date on everything medical school interview 2018-2019 with The MedEdits Interview Resource Center. Do you think the 515 you got on your MCAT will guarantee your admission to medical school? Think again. It is very important, regardless of your academic or extracurricular success, that you make a great impression during your medical school interview. Your interview experience will typically determine if you are accepted to, or rejected from, a medical school. What are the different types of medical school interviews for which MedEdits can help me prepare? An open ﬁle interview is the most common type of medical school interview. In an open ﬁle interview, the interviewer has access to all of your information, including all written documents, letters of reference, and test scores. The interviewer may have none or limited access to your materials. These interviews therefore offer an opportunity to control the interview and dictate what is discussed. Panel interviews typically consist of three interviewers and one interviewee. These interviews typically involve several interviewers and interviewees. The objective is to see how each applicant works with and responds to others. Students rotate through a variety of “stations,” remaining at each for eight to ten minutes to address a particular scenario or question. Multiple mini interviews are designed to evaluate an applicant’s professionalism, values, communication skills, ability to work with a team, compassion, and ability to consider all aspects of a situation. Outside of school, what do you do for fun? What parts of medicine excite you and why? How do you envision using your medical school and residency education? How do you know you want to be a doctor? 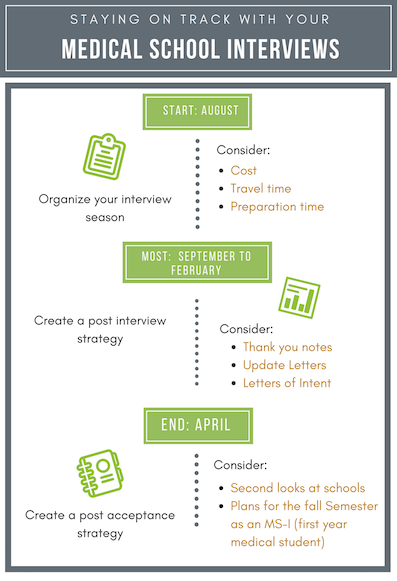 Do you need help preparing for a Multiple Mini Interview (MMI)? Your MedEdits faculty member will help you feel confident on interview day. 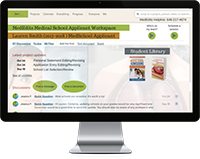 By partnering with MedEdits, you will work with former medical school admissions faculty members who have helped, literally, hundreds of people gain admission to medical school. As medical school faculty, we have also been privy to countless behind the scenes post-interview discussions. No one in the industry has our level of wisdom and expertise nor our record of success. Work with MedEdits and shine. Get coached by the most experienced and established medical educators in the industry. 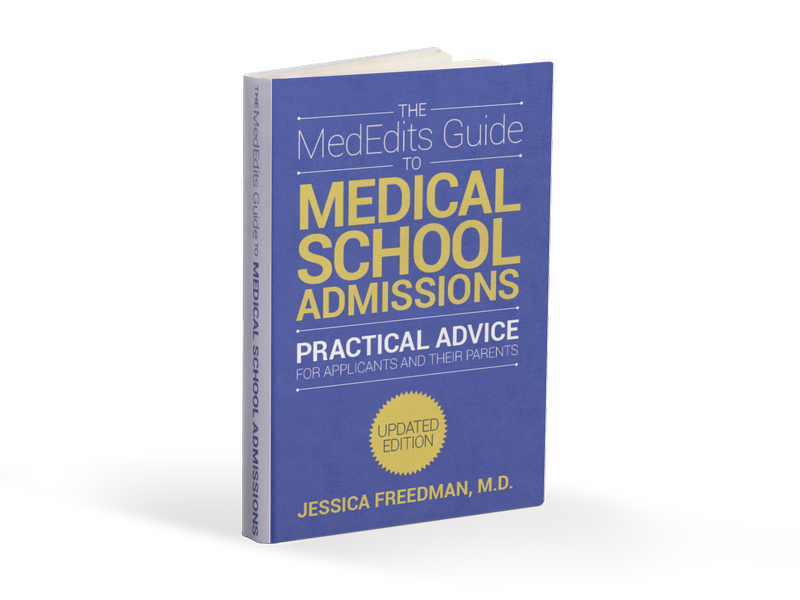 Applicants also purchased our top ranked Amazon.com book, The Medical School Interview by Dr. Jessica Freedman.